The two Marconi operators on board Titanic were Jack Phillips and Harold Bride. Their first distress message was sent out at 00.05 hours (ship’s time) on 15 April (about 25 minutes after the ship struck the iceberg), after which they were continuously occupied in emergency communications until loss of power to their equipment meant they could do no more. Both then abandoned ship, shortly before it foundered at 02.20 hours. 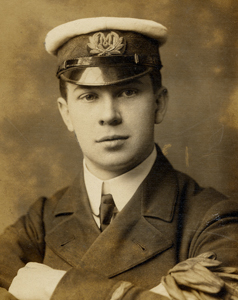 Phillips, the senior operator, was lost, but Bride was picked up by Carpathia, where he assisted the sole radio operator in dealing with a constant exchange of messages in the following hours. The Carpathia finally docked at New York on 18 April and Marconi visited his exhausted operators on board. He had recently arrived there himself on the Lusitania, having at a late stage changed his original plan to cross the Atlantic on Titanic. Photograph of Jack Phillips, the radio operator who was drowned in the disaster. 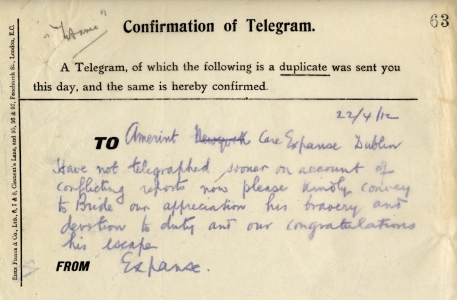 Message conveying the Company’s appreciation of the bravery and devotion to duty of Harold Bride, the surviving radio operator from the Titanic. 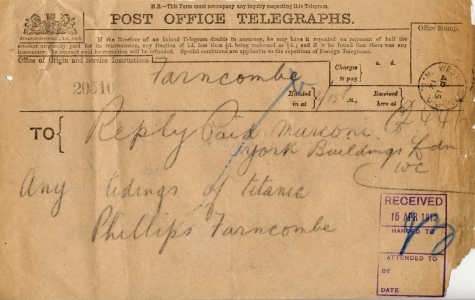 Telegram from George Phillips, father of Jack Phillips, seeking news of his son.